i’m not sure what possessed me to think i could make this fella in 2 weeks in secret in time for rasputnik’s birthday. in the end i had to give him the option of a surprise present that might be completed in time for christmas, or spilling the beans before he was done, and finishing him in the evenings. 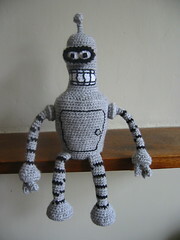 overall i’m pretty pleased, although i reckon his body’s a bit too fat and his arms are a bit too long and he’s just a little understuffed (bender, not rasputnik :P). i was pretty surprised that there was no existing amigurumi pattern, i would have thought he’d be an obvious subject. i was initally inspired by this post at crochetville, but she doesn’t seem to have published the pattern anywhere, and he was bigger than i wanted anyway. so i had to wing it, based very loosely around the amineko pattern. i’ll post the pattern up, although i haven’t tested it, and there are prolly some mistakes. i’m not going to write it up in full either, just post row charts, since it’s really straightforward enough to work from those. also, if i were making again i would probably refine things like the body shape. the arms could be a bit shorter if the torso were narrower too. then there are other little tweaks like sewing the legs and arms in the right orientation so you don’t see the stripe jog. or this could be fixed by working the legs and arms in rows rather than a continuous spiral, although the fabric looks noticeably different this way (this is how i worked my amineko, so the stripey body joined up a treat, although i now think i prefer the look of the traditional spiral method).